I have just moved to Colwood from South Delta, and the Colwood Crawl is much worse than getting through the Massey Tunnel, commonly referred to as the worst traffic jam in B.C. In Richmond, you have shoulder bus lanes on Highway 99 and, using the bus, you can zoom by all the cars. And the bus lanes in Richmond were built quickly, not in short sections as is being done here. It is time for the provincial government to get shoulder bus lanes built all the way to the Six Mile Pub area. 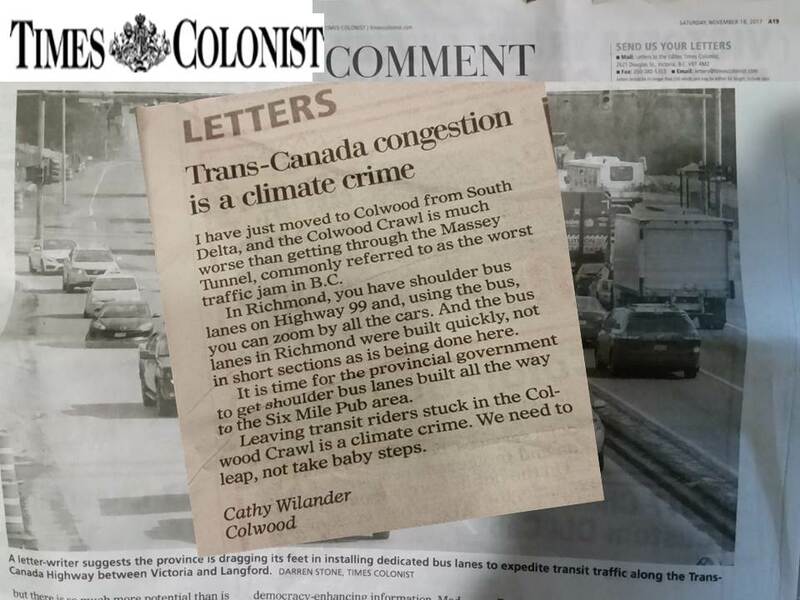 Leaving transit riders stuck in the Colwood Crawl is a climate crime. We need to leap, not take baby steps. Next Next post: Great Letter by Brentwood Bay BTA member!